It is the debut film of writer/director Boots Riley, a 1990s hip hop artist originally from Chicago. The flow of the story is stream of consciousness, but the narrative drives many issues and economic/political points home. Art, commerce, materialism and even slavery is skewered, often to no points of recovery. The centerpiece is the use of the “white voice” in sales (aided by the voiceover work of David Cross and Patton Oswalt) to gain success for an African American telemarketer, and what he must lose along the way to keeping gaining. It’s radical tone is similar to a 1960s satire called “Putney Swope” (set in advertising), but applying the accelerator, as it speeds along to its own rhythm. It is the most original artist statement in cinema so far this year. 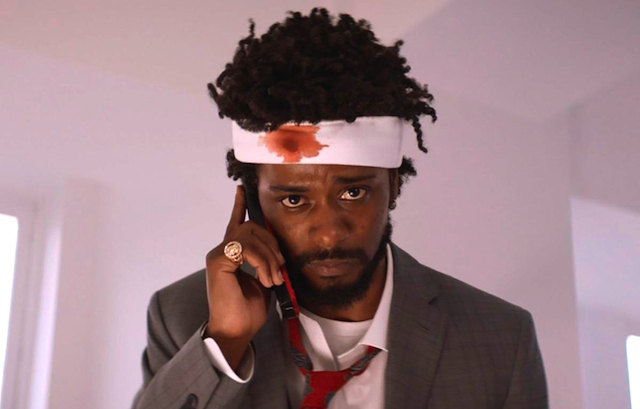 In an alternate universe Oakland in the modern day, a young adult African American man named Cassius (Lakeith Stanfield) is starting a new job as a telemarketer at a company called RegalView. This workaday world is counter to his performance artist girlfriend Detroit (Tessa Thompson), but Cassius needs the money to pay his Uncle Sergio (Terry Crews) his back rent. Cassius sits next to Langston (Danny Glover), who gives him a tip on how to be more successful in phone sales… use a “white voice” (David Cross). The absurd nasally tone makes the redubbed “Cash” the biggest seller on the floor. When he moves up to the executive tower, his success comes with another price, amid a strike at RegalView and a secret at its questionable subsidiary WorryFree. But Cash is going to the top, and CEO Steve Lift (Armie Hammer) wants to use him on the way.